Welcome to Red Roof Inn & Suites Lake Charles in Louisiana! This hotel is a pet-friendly, family-friendly hotel that is a great place to rest and relax when youre having fun in the Gulf Coast. When you visit us, you can search for pirate Jean LaFittes treasure (rumored to be hidden along our lakeshore!). Or, come join us during Mardi Gras season, the Cajun French Music Festival and Food Festival or the Cal-Cam Fair. If you enjoy gaming and nightlife, were the place for you, with 247 gaming on either side of the I-10 Bridge and great nightclubs featuring live music and fun. Red Roof Inn & Suites Lake Charles features a sparkling outdoor pool open year round. Our 56-room hotel has interior corridors, a public laundry on site. 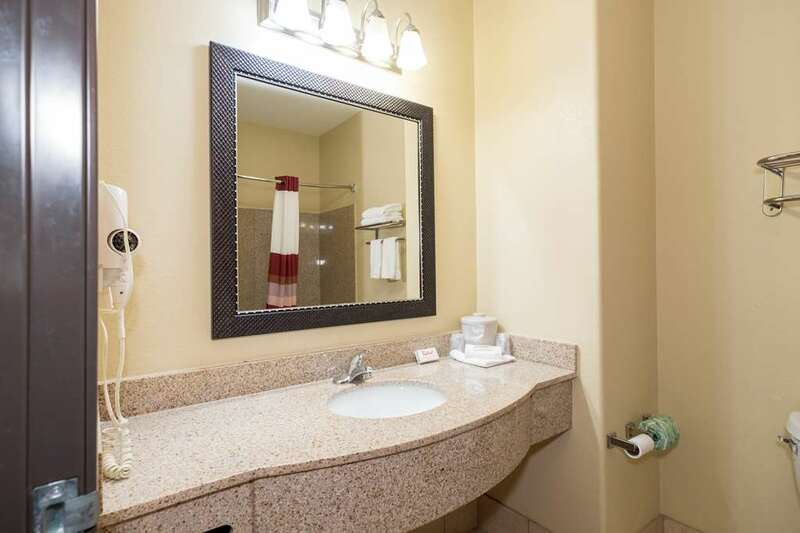 All guestrooms feature a 32-inch flat panel TV, a mini-refrigerator, microwave, voicemail, free wireless internet, and cable TV including HBO. Experience our complimentary coffeehouse-style coffee and tea as well as continental breakfast in the lobby. Hotel staff is on duty 24 hours a day. One well-behaved family pet per room is welcome.